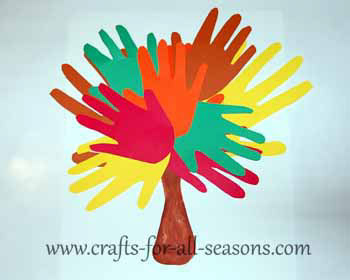 This handprint tree is an excellent preschool craft for kids. If you are a teacher looking for Fall crafts for kids in your school room this year, consider making a Fall tree on a mural in your classroom. 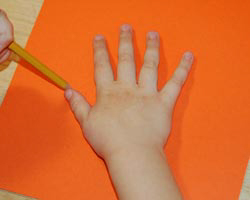 Each child can trace their hand on a different shade of colored paper, and cut out their hand. A large tree trunk can be painted on a mural and each child can glue on their hand as leaves. This is also a nice fall craft to make for grandparents, which each leaf being one of the grandchildren. Or, you can do as I did here, where most of the leaves are those of my four year old daughter. 1. Have each child trace around their hand on the different shades of paper, and have each child cut out their hand shape. 2. 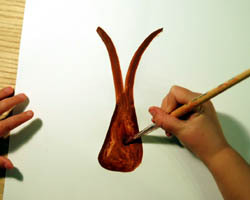 Paint a tree trunk with some large branches on the background paper. 3. Have each child glue their hand on the tree as leaves.